To take full advantage of all the Skype features you need to download and install the most recent version of the application. You can find it on the official website service. Go to the official website of the program (skype.com) and go to Downloads. 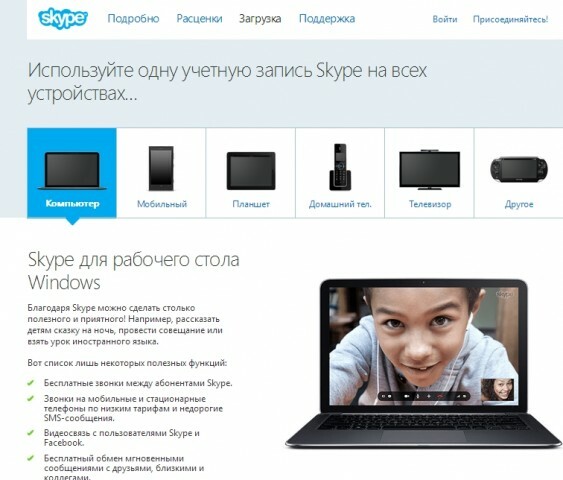 A page from the device selection, to which will skachivatcya and installed Skype. Let us consider. By default, a page to download Skype to your computer. 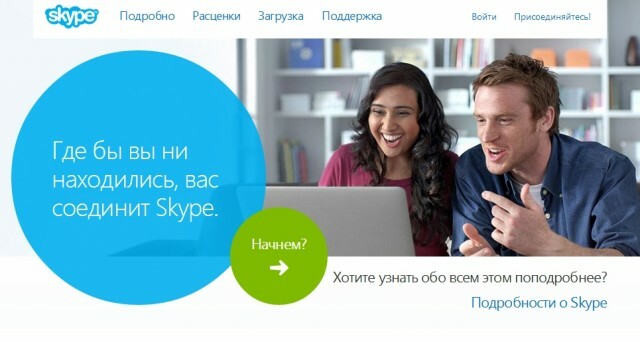 The proposed version of Skype is designed to work on Windows XP SP3, Vista, 7, 8, 8.1. At the bottom of the page on the Computers tab, there are links, on which you can download Skype for other operating systems. For Windows 8 you can download a separate version, more optimized for this system. To do this below, a word or select a different version in the box with Windows 8 click on the link Details of Skype for Windows 8. A new page opens with a description of features of the program and download link. If you are running on your computer Macintosh, in the field Macintosh Press on Details about Skype for Macintosh, and on the next page, click on the green button Skype for Macintosh. To install Skype on the operating system on the basis of Linux go to the appropriate section in a similar manner (by clicking on Details of Skype for Linux. On the next page in a special box, select your distribution. 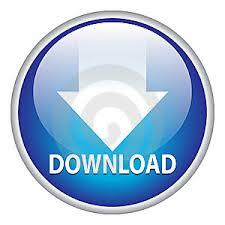 Download the program will automatically start. The program can be installed on Windows Phone, Android, iPhone и BlackBerry. 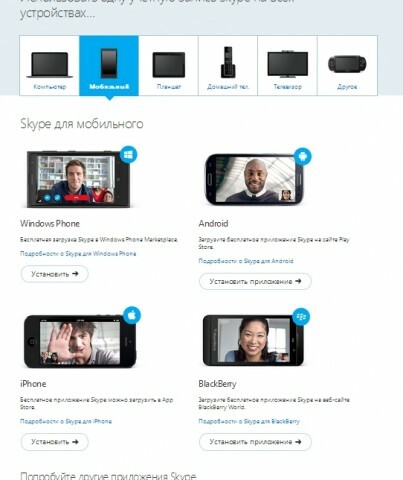 For, To download Skype for your mobile phone, go to the tab Mobile the website Loading. If you went to the site via mobile phone, you can just press the button Install a suitable version of the OS. Appendix Download and automatically install on your mobile phone. Select the appropriate tablet (or OS) and click on Details on ... You'll be taken to a page, where you can download and install Skype for your tablet. So we looked at the process of downloading Skype for basic devices: computer, phone and tablet. About tom, download Skype on other devices (home phone, TV iPod and PlayStation Vita), You can study the relevant sections of the official site.